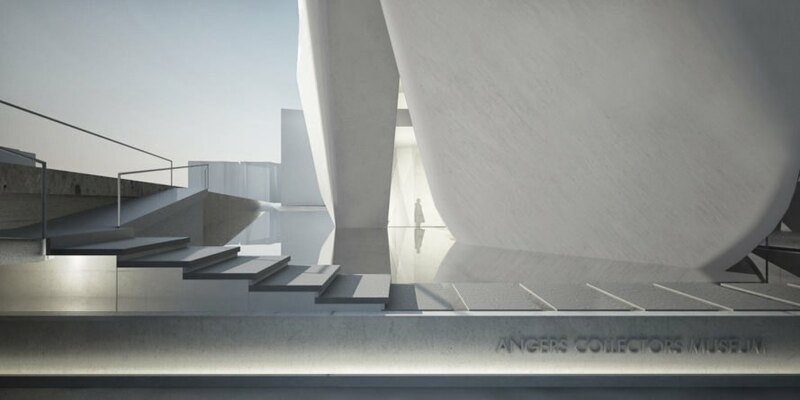 Steven Holl Architects and Compagine de Phalsbourg have won an international design competition for the new Angers Collectors Museum (Le Musée des Collectionneurs) and hotel in the heart of Angers, France. Envisioned as a new cultural gateway, the sculptural museum is undeniably modern yet pays homage to its historic settings and derives inspiration from the nearby historic Chateau d’Angers located across the river. Geothermal heating and cooling will be used to reduce the museum’s energy footprint. Built of exposed titanium white concrete, the 4,742-square-meter museum has a striking sculptural appearance that will be set within a series of reflecting pools—filled with recycled water—in a nod to the site’s riverine history. 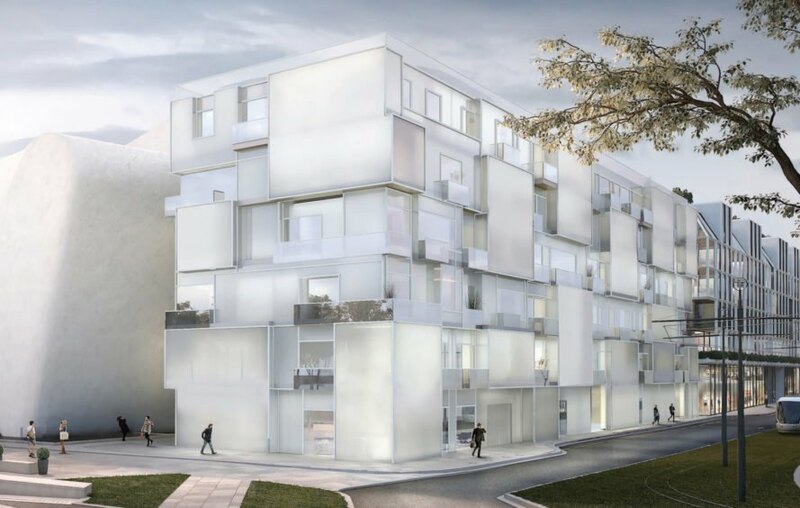 The museum will be connected to a linear hotel clad in clear and translucent glass for a mosaic-like effect inspired by the 14th century Apocalypse Tapestry on display in Chateau d’Angers. In addition to the museum and hotel’s prime riverside location on the east bank of the Maine River, their proximity to Le Quai, the city’s largest theater, further cements the buildings’ future as the cultural heart in Angers. The museum will share a rooftop restaurant with the hotel as well as a public sculptural garden at the ground level. 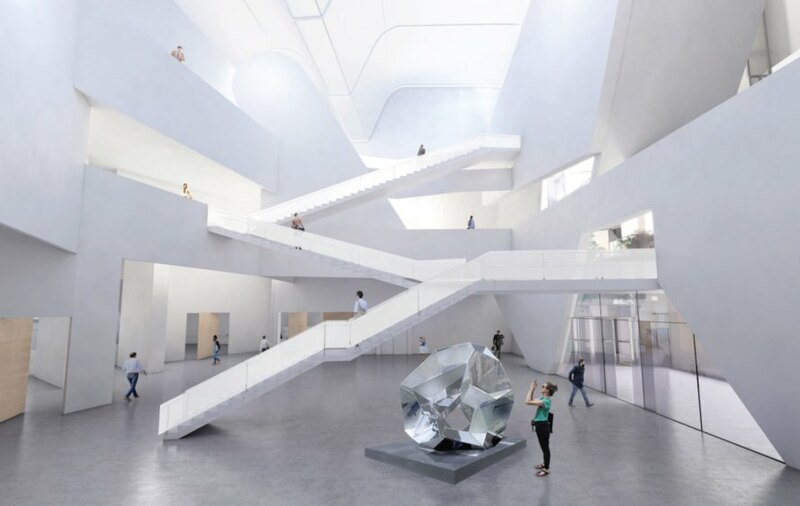 Steven Holl Architects and Compagine de Phalsbourg have won an international design competition for the new Angers Collectors Museum (Le Musée des Collectionneurs) and hotel in the heart of Angers, France. 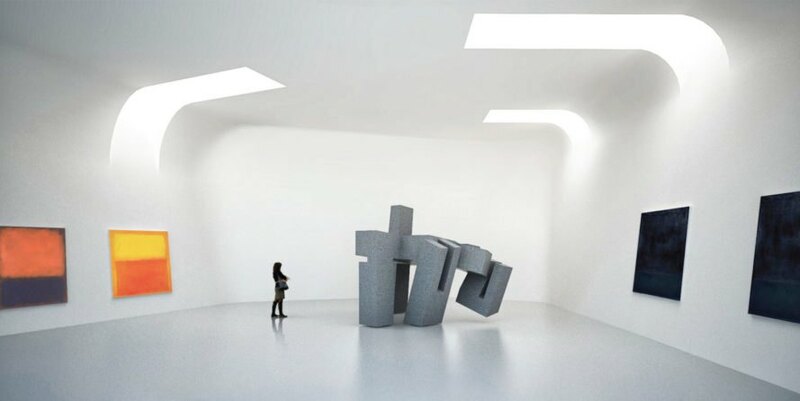 Envisioned as a new cultural gateway, the sculptural museum is undeniably modern yet pays homage to its historic settings and derives inspiration from the nearby historic Chateau d’Angers located across the river. Geothermal heating and cooling will be used in the museum to reduce the building’s energy footprint. Built of exposed titanium white concrete, the 4,742-square-meter museum has a striking sculptural appearance that will be set within a series of reflecting pools—filled with recycled water—in a nod to the site’s riverine history. The museum will be connected to a linear hotel clad in clear and translucent glass for a mosaic-like effect inspired by the 14th century Apocalypse Tapestry on display in Chateau d’Angers. In addition to the museum and hotel’s prime riverside location on the east bank of the Maine River, their proximity to Le Quai, the city’s largest theater, further cements the buildings’ future as the cultural heart in Angers. The museum will share a rooftop restaurant with the hotel as well as a public sculptural garden at the ground level.